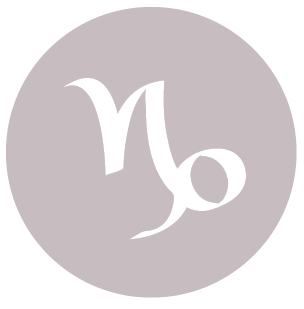 The Moon is in Scorpio all day (until Thursday, November 12th, at 10:13 AM). 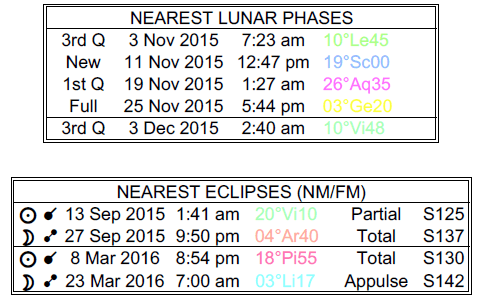 A Last Quarter Moon occurred on the 3rd, and a New Moon will occur tomorrow. 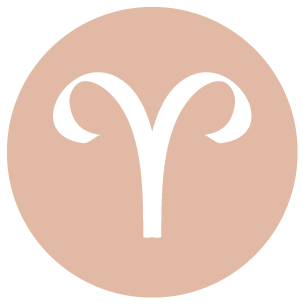 This is an excellent day for review of all kinds, dear Aries, and perhaps some research as you prepare for a new cycle that begins tomorrow with a New Moon. 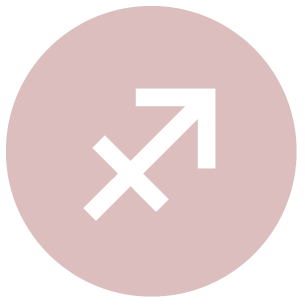 A Mercury-Pluto connection encourages useful insight into business or financial matters, as well as strategy in general for achieving important goals. It can also give you a real sense that you can work on emotional matters successfully, conquer fears, and put a hampering problem behind you. There can be an intimate moment today that opens you up to new possibilities and that inspires you. For some, it’s about sharing a bit of yourself with someone you love. Work matters can be especially fruitful now, and you might see areas that you can improve that will bring rewards going forward. You may be making important changes and edits that leave you feeling prouder of what you do. 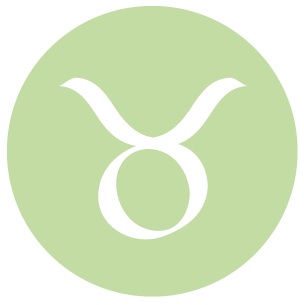 Today is strong for honing in on areas of waste or neglect, dear Taurus, with a plan to turn them around. It can also be a time for gaining new insight into a person you care about or a relationship’s dynamics. You can make a good connection through, or feel supported by, a partner, friend, or in-law. It’s a strong time in your life for warm, positive energy with others, and for creative activities or entertainment that allow you to express yourself in new ways. Friendly gestures and communications from others lift your spirits to new heights, or you might decide to be the one to reach out to others, finding joy in inspiring or motivating others. A New Moon will occur tomorrow in your opposing sign, bringing nice energy for starting fresh in a relationship. Today, observe others and listen to your own heart for clues as to where you might want to head, whether this is toward or with a relationship. 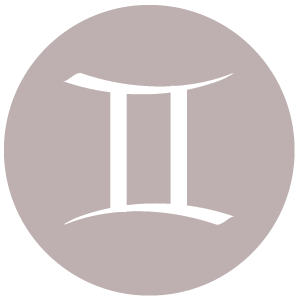 This is a strong time for seeing something more clearly, dear Gemini, or for gaining new insight into your work, business, family affairs, or health, dear Gemini. The Moon is Balsamic, making today better for reflection than new beginnings, but it’s an excellent time to get to a better understanding of your own needs and for getting a better handle on your responsibilities. This is an important day for seeing what is no longer good for you, whether that’s an attitude, a project, a habit, or possibly even a habit. There can also be important information coming in about work possibilities or your present job, and you might be projecting an especially positive message about your skills and abilities. You can send a positive message about your own competence and skills. Opportunities to work from home, to reorganize and improve your home life, or to make your daily affairs a little easier, may pop up now. Enjoy yourself and express your affections for the people you love. 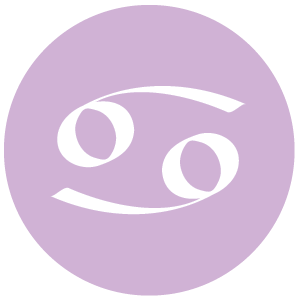 You can gain new insight into a partner, love interest, or relationship itself today, dear Cancer. There can be a pleasantly intimate feel to the morning, which suits you just fine! Conversations with a partner, romantic interest, and children are especially good and helpful today. Creatively speaking, it’s a time for seeing things more clearly and for feeling things more deeply, but also for expressing yourself with power and positivity. You have the ability to create a pleasing balance between fun and work. Particularly later today, you can enjoy a good feeling of growth in your connections. You might also be inclined to flirting or more serious expressions of affection. With a New Moon occurring tomorrow, today is better for reflecting and tying up loose ends, however, than for entirely new endeavors. Take the time to see what needs to go and what you want to bring forward with you in the new cycle ahead. A mystery may be solved this morning, dear Leo, or a conversation occurs that provides the missing puzzle piece. It’s a good time to sort out your work or home space and get into a more organized head space as well. Focus should be on what needs to be left behind, dropped, and wrapped up – those things you don’t need to bring forward with you. There is good energy for projecting a sunny, warm disposition. Fulfillment comes through attention to family matters and personal possessions, and feelings of support derived from your closest connections. You might enjoy especially warm relations with family, and take great comfort in the security that comes with it. 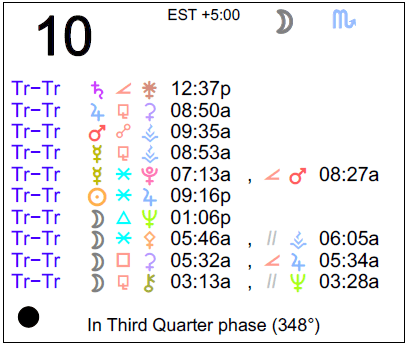 Don’t be afraid to get creative about family, money, home, and business matters, but save brand new beginnings for after the New Moon that occurs tomorrow. 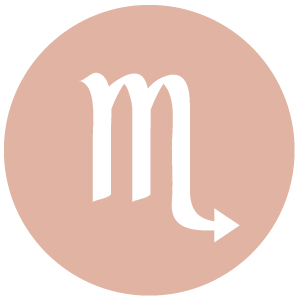 Your insight is strong today, dear Virgo, so that you can get to the bottom of an issue that was previously baffling. Relationships with children can also be enhanced today. Conversations cut to the chase. As the day moves forward, a spirit of openness emerges and grows. This can open up doors to you for self-expression. It’s a strong day for all things social, and there might be a revealing conversation, a piece of good news, or new information coming in that makes you happy. Your connections with others, including siblings, acquaintances, and classmates, can grow by leaps and bounds. Establishing trust can be successful now. Keep in mind that there is a New Moon tomorrow, making today strong for reflection and letting go rather than brand new launches or endeavors. Insights about your money situation or business today can help you to reach for new goals after the wonderful energy of the New Moon tomorrow, dear Libra. You are especially insightful when it comes to how to make your life more secure and comfortable, and what attitudes or projects may be better off left behind you in order to make room and space for new ones to enter your life. While you’re a little more retiring than usual, some networking or socializing today could bring financial tips or money-making ideas or simply a boost in mood. There is a gentle, positive touch to your manner, particularly as the day progresses, and this can help you to gain trust. It’s also a little easier than usual to see the bright side of things now. 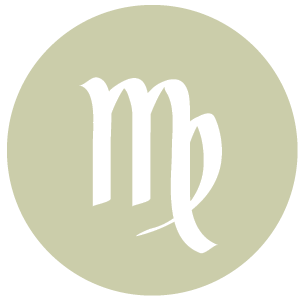 This is the day before a New Moon that will occur in your sign, dear Scorpio, and this is typically a time for laying low, resting, thinking, and letting go. It’s important to clear out space, emotionally and perhaps literally if your surroundings could use a clean up, so as to invite the “new” into your life. Today’s energies are a little busier than usual, but not so stimulating that you won’t have time to think about new goals and aspirations. In fact, a pleasing aspect between Mercury and your ruler, Pluto, this morning can encourage you to dig a little deeper for ideas. It’s a great influence for seeing your priorities. 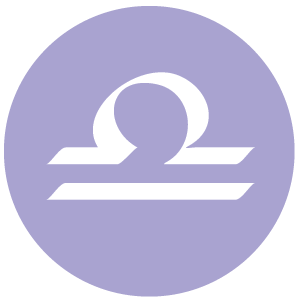 As the day moves forward, the Sun in your sign harmonizes with optimistic, generous Jupiter, and this encourages making connections and improving friendships. You may be gaining someone’s trust, clearing the air, and feeling better for it. There is nice energy for tying up loose ends today, dear Sagittarius, and for making peace with the past, for several astrological reasons. The Sun and Mercury are both in your sector of karma, the past, and privacy, and both bodies get help from growth-oriented bodies – Jupiter and Pluto, respectively. As well, today’s Balsamic Moon lends beautiful energy for releasing, purging, and letting go of those things you no longer need. New insight into past matters can come now, and may lead you to very important conclusions. While you may not be especially accessible today as you can be quite wrapped up in your thoughts, you nevertheless have a warm glow to you. You might reach out to others in order to help. An open hand, a generous spirit, and integrity are key ingredients to your success on social and practical levels today. Rest, heal, and reflect today for best results! 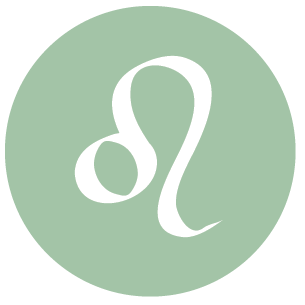 This can be a wonderful time in your life for teaching, learning, and sharing, dear Capricorn. Friendships are in strong focus, and so are team efforts, group associations, community goals, and long-term plans that excite and motivate you for the future. You are thinking in innovative ways, and this will help you to maximize the potential of tomorrow’s New Moon. Today, you need to also look to the present and past in order to see what you may need to let go or put aside in order to make room for new energy coming in. A new insight into a friendship, or even a business deal or long-term plan, can be had now. There could be special ease felt with others. Educational, travel, and other mind-expanding activities can thrive, or opportunities for these things can present themselves in the coming weeks. Now is a good time to learn about your deeper needs and desires so that goal-setting in the coming week will be a true reflection of what’s in your heart. There is more power to your communications, dear Aquarius, and generally an inability to escape attention today! This can be a very strong day to discuss professional and business-related matters with a trusted authority, mull over life path goals on your own, as well as to brainstorm and come up with solutions with others. The image you project now and in the coming weeks is important to your overall progress. Tomorrow’s New Moon sets you on a new path as you redefine your goals or plump out the details of current plans. Today, it’s more appropriate to learn your heart in order to know what’s best for you, or what to strive towards going forward. You can have a good sense that whatever leaves your life now is no longer necessary. Some of you could gain support from a surprising or hidden source, and most should enjoy favorable attention from both superiors and peers. 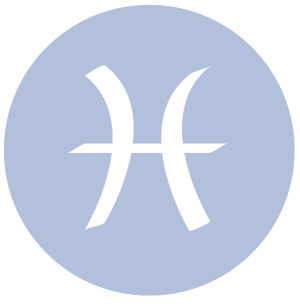 This is a good time for coming to a greater understanding of a recent problem or setback, dear Pisces. This is a good time for friendships, networking, making connections, and partnering or negotiating matters. Others can be integral to goals that involve learning new things and even a new trade, gaining exciting experiences, publishing, traveling, teaching, or learning – all themes that are emphasized in the coming weeks with a New Moon about to occur in the sector of your solar chart that rules these things. The common denominator here is broadening your horizons. This is a time for expanding a business, idea, or relationship, and for taking something to new heights. Today, take in all that you can. Information can surface that helps you, or this may be about becoming inspired to alter your path. For some of you, there may be a shared adventure or new experience occurring soon that enlivens your relationships. 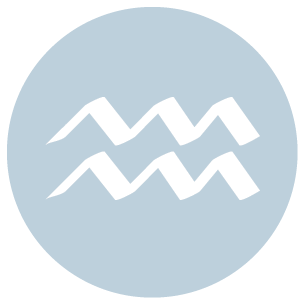 If Your Birthday is November 10th, If Today is Your Birthday full horoscope here. Hurt feelings may be opportunities for healing. Now is the time for building bridges, not burning them. Self-indulgence is more likely now. We’re not as inclined to consider the consequences of over-eating, over-drinking, or overdoing in general. We may be acting in a haughty manner. This is a feel-good time if we allow ourselves to relax and tune into the subtle aspects of life – art, nature, beauty, dreams, and spiritual realms. We absorb things easily, our senses are in good form, and we more naturally accept things and people as they are. There is no need to look for definite answers right now. This is a good time for serious and determined study and investigation. We are drawn to looking for truths and to unexplored topics and ideas. Penetrating conversation. Power in speech. Persuasion. Talk of change and sexuality. Psychological issues. Exposure. Questions are raised, discussions can become heated, and there can be nervous excitement now. Enthusiasm is likely, but may go a little too far. Impulsive speech or other communications. Mechanical breakdowns are possible. There can be distractions and difficulty focusing now, and important details may be missed in the process. There may be a superficial interest in a project or a misjudgment of how much effort something requires. We may be putting a lot of energy and time into our loved ones or projects and causes, but we have a tendency to do this to excess. We can experience overload, or a feeling that we can’t pursue our own goals as a result. 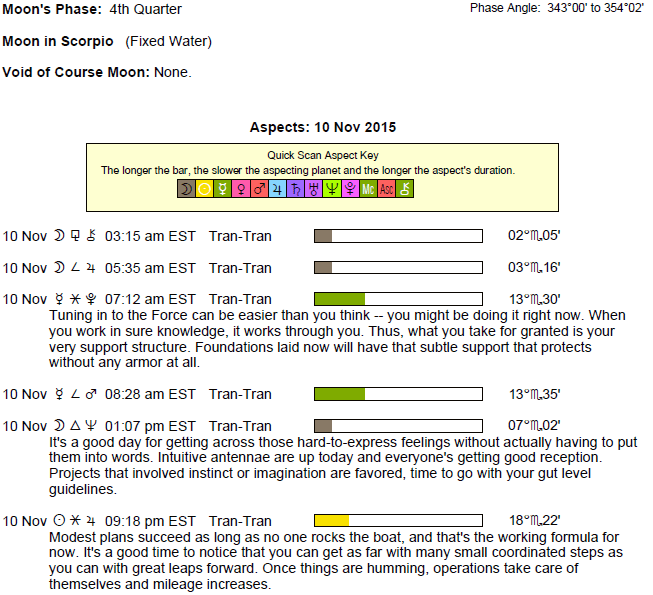 We are not very goal-oriented right now, or motivation to pursue our goals may be waning/lacking. Changes feel overwhelming. Enthusiasm may be low, we argue less, and we think more than we take action. We are more compassionate, emotional, and intuitive than usual, and we may react emotionally to situations, possibly at the expense of logic or practicality. We are speaking with feeling or intellectualizing our feelings. We express feelings and thoughts with clarity. We are busy, alert, curious, and communicative. This can be an excellent time for cooperative projects. Ideas flow freely and surface spontaneously. We are turning into the subtle aspects of life – art, nature, beauty, dreams, and spiritual realms. We more naturally accept situations and people as they are. Sensitivity, compassion. You are a passionate and intense individual. You may gain attention through creating dramatic situations. You may also be secretive. Sabian Symbol: A woods rich in autumn coloring. There can be a good, nice, and healthy feeling of optimism and confidence now. We might promote, publish, advertise, or market with greater success. We are generous and tolerant, giving people the benefit of the doubt, expecting the best from others and from ourselves. We can see the big picture. You have difficulty coping with anything out of the ordinary. You need to make adjustments to allow yourself to express your unique talents and original thoughts. We find it easier to bounce back from criticism, rejection, or feelings of insecurity; to humble ourselves. We can be filled with a sense of purpose. We more easily cooperate with others. You use resources well. You have a tendency to delve into the core of matters, preferring this to superficial knowledge. You may also be a worrier. Communications with you are intense. Sabian Symbol: Telephone linemen at work. You are able to research topics and form your own opinion. You may be impatient with superficial understandings. We can be more understanding and sympathetic to others now, particularly when it comes to sensitivity with what or how we communicate. We might talk or learn about healing methods. You have a strong need for relationships. You will also require your relationships to be harmonious, peaceful, and creative. You enjoy having beautiful possessions. Sabian Symbol: The dawn of a new day, everything changed. This is a passionate, lively, expressive influence. Social relations are impassioned, and perhaps demanding or combative. We may also feel compelled to do something creative or artistic. We have a chance to express our needs, passions, and desires now in effective ways. Venus can act to soften Mars’ aggressiveness, or Mars can make Venus’ romantic impulses more forceful and pressing. Some level of competition is present in our interactions. Impulsive purchases are possible. You are a loyal and faithful partner. You like commitment and a common purpose in relationships. Your destiny is linked with the need to develop harmonious and balanced relationships. Relationships will play an important role in your accomplishments. You need to make sure that your need to keep the peace does not hinder decisive action. You will pursue your personal desires in a practical and methodical manner. You may be critical if opposed. Sabian Symbol: A man gaining secret knowledge from an ancient scroll he is Reading. You are being challenged to become assertive and focussed on your personal goals. Independence and self-confidence are keys to your growth in this life. You may find yourself thrust into leadership roles. Sabian Symbol: A swimming race. You need to learn how to put all your enthusiasm to good use. You lack self discipline and leave the details of your grand schemes to others to sort out. Learn to manage yourself better and you will achieve much. Sabian Symbol: A game of cricket. Sabian Symbol: An empty hammock. A long-term influence in which fantasy, imagination, compassion, and spirituality are in stronger focus. (April 4, 2011 to August 4, 2011, then February 3, 2012 to March 30, 2025, then October 22, 2025 to January 26, 2026). Sabian Symbol: In a huge tent a famous revivalist conducts his meeting. Sabian Symbol: A party entering a large canoe. Sabian Symbol: A crowd upon a beach. Sabian Symbol: A hindu healer. Sabian Symbol: A butterfly made perfect by a dart through it. Sun 00° Taurus 03' 10"
Moon 12° Scorpio 48' 07"
Mercury 04° Aries 02' 44"
Venus 29° Pisces 41' 58"
Mars 13° Gemini 16' 50"
Saturn 20° Capricorn 26' 34"
Uranus 02° Taurus 22' 56"
Neptune 17° Pisces 43' 38"
Chiron 03° Aries 29' 39"